JACKSON HILL, born in Birmingham, Alabama in 1941, was a Morehead Scholar at the University of North Carolina, Chapel Hill (Ph.D. in musicology in 1970). A composer from the age of 14, he studied composition with Iain Hamilton at Duke University (1964-66) and Roger Hannay (1967-68). He has served as a choral assistant at Exeter College, Oxford, and as a Visiting Fellow at Clare Hall, Cambridge University. He studied Buddhist chant as a Fulbright Fellow in Japan in the 1970s, and Japanese traditional music has been a strong influence in his work. He has received numerous awards and prizes for his music, which includes choral, solo, and chamber music, and as well as a chamber opera and three symphonies. Hill’s music has been widely performed in Europe, Asia and the Americas, including performances at the Tanglewood, Ravinia, Chautauqua, and Edinburgh festivals. Recent commissions have come from Lichfield Cathedral, Chanticleer, The King’s Singers, the Fitzwilliam String Quartet, New York Polyphony, baritone Roderick Williams, The Lyric Consort, Williamson Voices, countertenor Ryland Angel, Ensemble Sine Nomine (UK), and The Three Choirs Festival (UK). 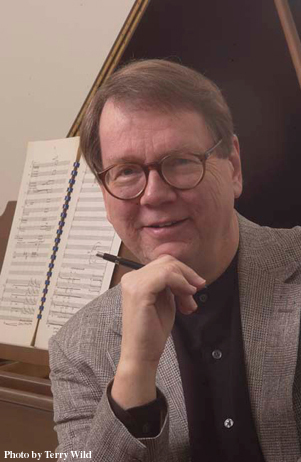 His composition Voices of Autumn was part of Chanticleer’s Grammy nomination in 2003. He taught at Duke University (1966-1968) and from 1968 to 2008 at Bucknell University, where he served as Associate Dean, Presidential Professor, and Chair of the Department of Music.